This is absolutely beautiful "Peacock" necklace. It is in wonderful condition, it has only light signs of wear and patina. 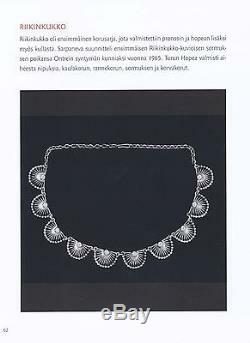 There's a picture of a "Peacock" necklace at page 62 in a book "Keräilijän aarteet, koko kansan korut, Pentti Sarpaneva". Originally Pentti Sarpaneva designed this model to celebrate the birth of his son Ontrein, year 1965. Length of chain 43 cm / 16,92. Height 1,8 cm / 0,7. Width 2,5 cm / 0,98. 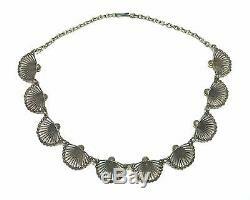 Weight of necklace 33 g / 1,16 oz. 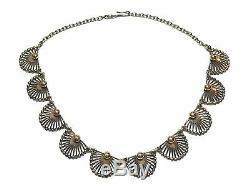 The item "Finland Pentti Sarpaneva Gorgeous Vintage Bronze Necklace Peacock Very Rare" is in sale since Friday, March 04, 2016.